The phone rings. One of Brendan Healy’s oldest and best friends is dead. Healy must return home to Hawthorne to found out why. Meanwhile, Agent Jennifer Aitken is investigating the same dark conspiracy involving politicians, prostitution, and black markets. The trail will put both her and Brendan’s life in mortal danger, as well as introducing Healy to the fascinating young woman Sloane Dewan, who may hold the key to it all. 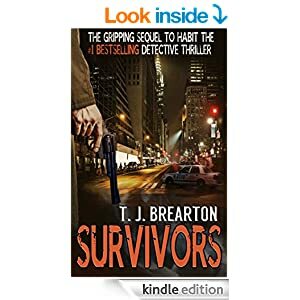 SURVIVORS is a beautifully written detective thriller with T. J. Brearton’s trademark tension and nail-biting twists. Readers have given over 120 five-star reviews to ‘Habit’, the first novel in the series. T.J. Brearton is the author of the #1 best-selling thriller HABIT which is part one of the trilogy. HABIT is available on Amazon now.